Enter the text that you want to check for grammar, spelling, and punctuation mistakes; then click the grey button below. Click on underlined words to get a list of proper wording alternatives, suggestions, and explanations. First, write out your text as usual in any word processing program that you prefer. Review it yourself first to catch any stray words or thoughts and bring them into order. 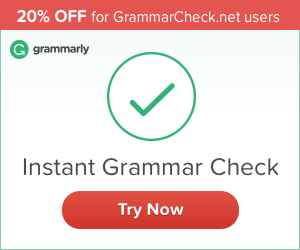 *GrammarCheck users are eligible for a 20% discount on new subscriptions and renewals if they sign up here.